Walter Orenstein and Manish Patel outline the steps needed for global polio eradication in a New England Journal of Medicine perspective article. The final push to complete worldwide polio eradication will require global collaboration on an unprecedented scale, according to a perspective article in the Feb. 11 issue of the New England Journal of Medicine. The goal is in sight, however, due to the tireless efforts of the immunization community and innovation in science, policy and implementation. The perspective by Walter Orenstein, MD, associate director of the Emory Vaccine Center, and Manish Patel, MD, of the Task Force for Global Health, describes in detail the steps needed to totally eradicate all three strains of poliovirus worldwide. Polio cases have decreased from approximately 350,000 cases in 125 countries in 1988 to 73, and polio transmission by wild polioviruses had been stopped in all countries except Pakistan and Afghanistan as of the beginning of 2016, say the authors. The Global Commission for Certification of the Eradication of Poliomyelitis recently certified that type 2 poliovirus (one of three strains of the virus), has been eradicated. Although oral polio vaccine (OPV) has been the key to control of polio, in rare cases it has been linked to vaccine-associated paralysis or viral mutations resulting in vaccine-derived polioviruses. Vaccine derived viruses behave like wild viruses causing outbreaks of disease. For these reasons, OPV should be discontinued as soon as polio eradication is certified, say the perspective authors. At the present time, types 1 and 3 in OPV are needed because these types of wild polioviruses have not been certified as eradicated. But type 2 has been eradicated and continued use of the type 2 component in the trivalent OPV is causing disease and appears to be of little benefit. The eventual goal is stopping all three types of OPV, once types 1 and 3 are certified as eradicated. Stopping all OPV is now targeted for 2019. But with wild type 2 viruses now certified as eradicated, the present strategy for safe and effective eradication requires a switch from tOPV vaccine (containing types 1, 2, and 3) to bivalent OPV (bOPV, which contains types 1 and 3) as soon as possible. This global switch is now planned to occur between April 17 and May 1, 2016. Advantages of the switch include induction of better immune responses against types 1 and 3 with bivalent OPV than trivalent OPV, thereby hastening their eradication, and no longer causing disease with the type 2 component of the vaccine. 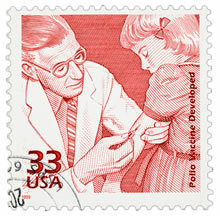 According to the Perspective, prior to the switch countries must complete preparatory steps, including boosting immunity to type 2 poliovirus through a globally synchronized effort to vaccinate all children with inactivated polio vaccine (IPV) to provide protection against type 2 should that virus re-emerge. IPV is safe and will not cause polio. They also must manage vaccine inventories and procure stocks of the bOPV vaccine, train health care workers regarding the switch, put plans in place to monitor outcomes, destroy type 2 wild poliovirus or securely contain it in laboratories, and dispose of remaining stocks of tOPV vaccines. A global stockpile of monovalent type 2 OPV should be available to control any new outbreaks, should the type 2 virus be reintroduced. “Coordinated communication among global health organizations, countries, manufacturers, and funders is imperative to ensure synchronized OPV2 withdrawal with minimal disruption in vaccination services to children worldwide,” say the perspective authors. Successful synchronization will also require Global Polio Eradication Initiative leaders and countries to monitor the completion of preparatory steps and outcomes of withdrawal of the vaccine in April 2016.